An epic history of adventure and adversity, of one man and a nation’s quest for redemption. George Mallory was the star of three successive attempts to summit a mountain that was at the time a complete mystery–its weather patterns and geography entirely unknown, the cultures that surrounded it viewed by the British with a misguided paternalism. Along with a host of fellow climbers, adventurers and scientists, Mallory was driven toward an accomplishment that the nation came to grasp as an outlet for its frustrations and a hopeful liberating triumph. While he was the principal character in the eyes of his contemporaries and in history, the other explorers also receive well-deserved and detailed attention in Davis’s account. 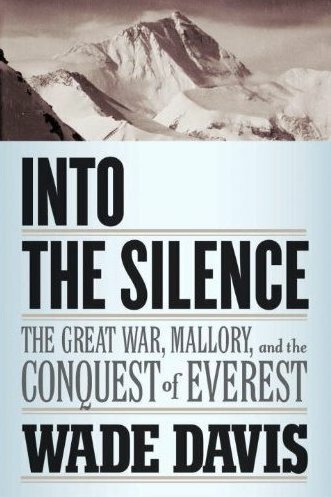 Into the Silence is a book about mountaineering and a respectable adventure epic with all the alpinist details, but it’s also so much more: a heartbreaking portrayal of war; the story of more than a dozen individuals whose lives were rocked by a war and a mountain; and finally, a history of a nation watching its own imperial era come to an end. This review originally ran in the November 4, 2011 issue of Shelf Awareness for Readers. To subscribe, click here, and you’ll receive two issues per week of book reviews and other bookish fun!